MTA Fare Hike? Not Without Accessibility! —March 27, 2019: We, people with disabilities, are working with the Peoples MTA and ALL who need elevator access. Join us outside the next MTA Board meeting. FB Event. 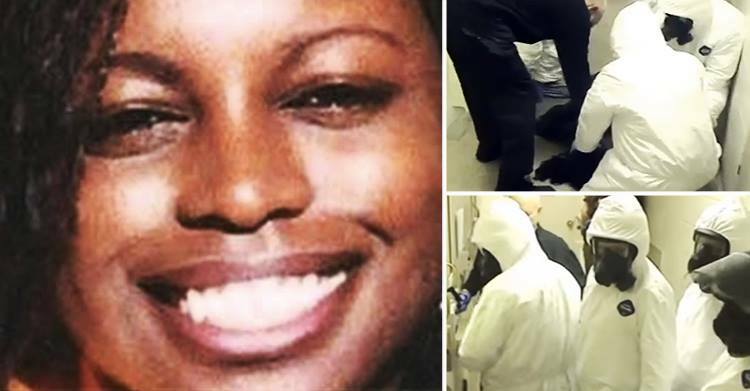 Malaysia Goodson is the 22-year-old African-American mother who in January fell to her death down the New York subway stairs. We will be closing International Women’s Month by using the occasion of the monthly MTA Board meeting to honor the memory of Ms. Goodson, who managed to save her 1-year-old even as she fell. The station where Goodson fell has no elevators. She was going down the stairs but that station only has escalators that go up. Goodson did what so many parents are forced to do: struggle up and down the New York subway stairs with a child and stroller — and hope for the best. Rally speakers will share their stories and honor Ms. Goodson by adding their voices to accessibility rights advocates who have been calling for elevators and ramps in the subway for years. Our gathering will make sure her name is not forgotten! –March 14, 2019: Courthouse Rally for Subway Access – Quit Stalling Cuomo! Facebook Event. Also see PeoplesMTA. –Background on struggle, especially bringing in role of disabled liberation. Support Fair Wages for All! Sunday, October 21, 2018; 2–4pm; Brooklyn Museum, 1st Floor. >>TAKE ACTION NOW<< We want the Shade/ Take back our parade! We need your support. CLICK HERE. –Sun July 15, 2018: FB Event. Phila Disability Pride Parade. FB Event. ###Get the EASIER TO READ version. The mission of Disability Pride NYC is to promote inclusion, awareness, and visibility of people with disabilities, and redefine public perception of disability. Our goal is to establish an annual Disability Pride parade in New York City and to support people with disabilities in whatever way we can. ***Sunday July 10, 2016: Join PPA at Disability Pride March. FB Event. – December 3, 2015 – save the date – International Day of People with Disabilities, a United Nations-sanctioned day that aims to promote an understanding of people with disability and encourage support for their dignity, rights and well-being. Forty percent of people killed by police have a disability. 1. Expanded mental health outreach: a) send mental health workers instead of cops to help people suffering from symptoms; & b) better funding for mental health services and divert funding away from cops to assist with this. 2. End the use of tasers on restrained people, and on people suffering from mental health issues. 3. End police torture of people with disabilities, and people of color. 5. No handcuffs for mental health episodes. 6. Better regulations; enforce the regulations that are already on the books. The entire month of July has been declared Disability Pride Month in the U.S. It is the 25th anniversary of the passage of the Americans with Disabilities Act (ADA), the landmark civil rights legislation for people with disabilities. After the ADA was passed, and after the heroic 1969 Stonewall Rebellion inspired annual LGBTQ parades, Disability Pride parades took place around the country during the month of July, the anniversary of the ADA’s passage. After several years without such parades, in NYC on Sunday, July 12, a Disability Pride Parade is being organized by a coalition of disabled peoples’ and disability rights groups, which has also been endorsed by several NYC agencies and elected officials. A Disability Pride event is also scheduled for Boston on July 22. 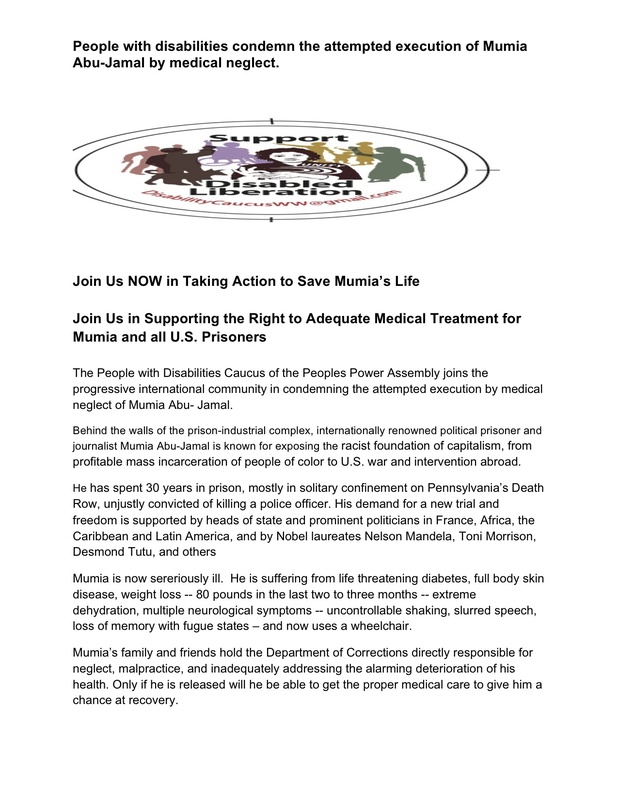 ***Urgent: People with disabilities condemn the attempted execution of Mumia Abu-Jamal by medical neglect. 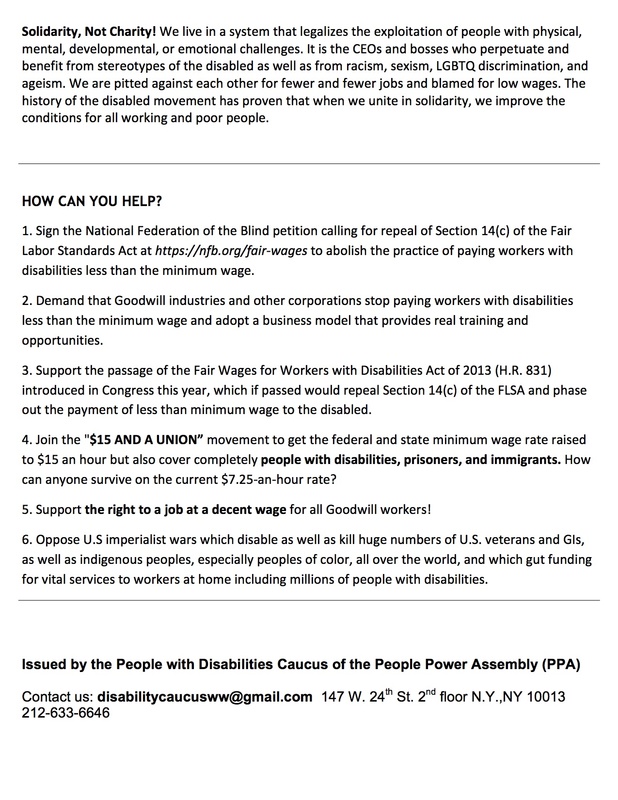 -Please support the ongoing struggle to make minimum-wage laws apply for people with disabilities, especially at Goodwill. -Scroll down for Nov. 2014 action at Goodwill. **Please TAKE ACTION: Sign the Petition to San Francisco Mayor & Attorney to drop their appeal. A case before U.S. Supreme Court seeking police exemption from the Americans with Disabilities Act (ADA) has critical importance for all those seeking to stop unwarranted police killings. 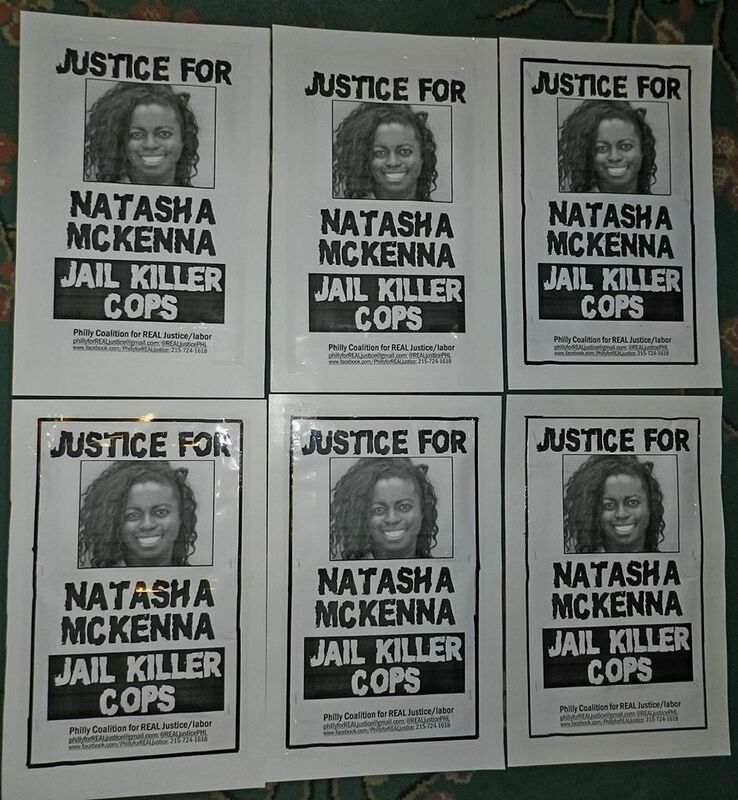 This case involves police shootings of people with mental illnesses. Your intervention is needed to stop the high court from using this case to strengthen the hand of the police and lessen police accountability in the killings of people with disabilities. The ADA mandates accommodations for those with disabilities. Even with the ADA in place, at least half of the people shot and killed by police each year in this country have mental health problems, according to a recent study (TACReports.org). In many cases, police who used deadly force were called by family or neighbors to help get an individual mental health care. Many of those killed were people of color. It would be especially chilling if police are exempted from the ADA…SEE REST OF LETTER. SIGN PETITION. For more background click here. 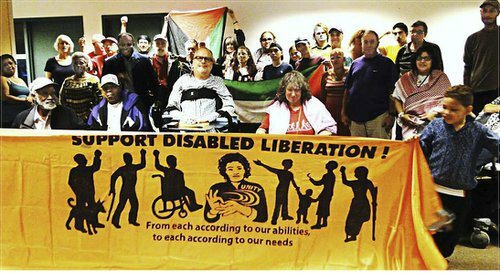 Activists with disablities build solidarity with labor and community struggles. 10/11/14. Activists with disabilities and allies from New York, Rhode Island and Massachusetts gathered at an 1199 Service Employees union hall in Dorchester, Mass., in August, 2014 to commemorate people with disabilities whose collective struggle led to the Americans with Disabilities Act being signed into law on July 26, 1990. 1/24/15. Disabled-rights groups are among the most energetic advocates of solidarity with African-American victims of police murder. This statement’s signers are both national and local groups, including organizations from Kansas, Minnesota, Montana, California, New York State and New England. They include the National Council on Independent Living and four local independent living centers; several autistic groups, including Autism Women’s Network; Little People of America; Queerability and other LGBTQ disability groups; several student groups; Help Educate to Advance the Rights of the Deaf; the Peoples With Disabilities Caucus of the Peoples Power Assembly; and Parents to Improve School Transportation. **2015: ON-GOING STRUGGLE. Read flier please. 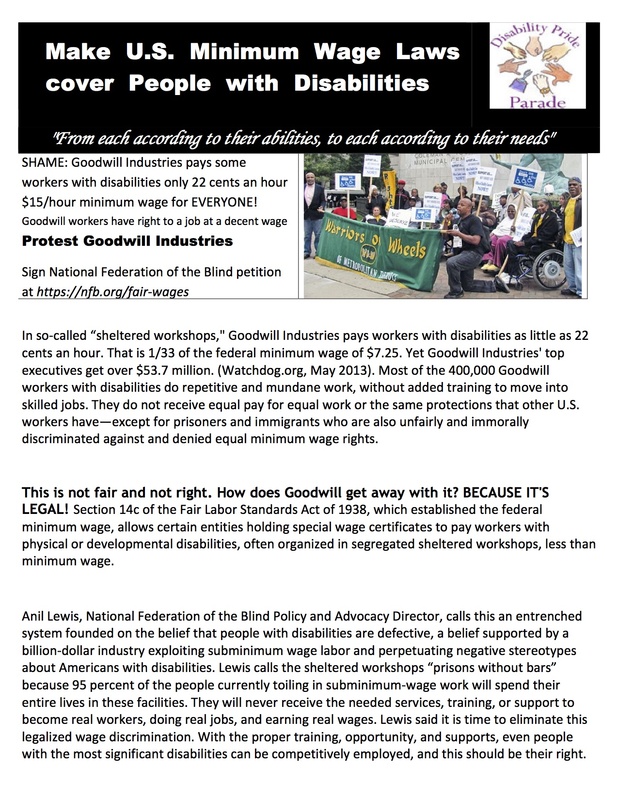 –Sat, Nov 15, 2014: 1 PM – Demonstrate at Goodwill: Stop paying people with disabilities 22c/hr; We demand $15/ hr & a union for EVERYONE including: People with Disabilities, Prisoners, & Immigrants. (Click to enlarge). Click here for pdf.